My husband is a gout patient and this causes his mood on and off for many years. Whenever the gout attack shows up, we both have to fight with it really seriously. Our rule of thumb is no medication to calm down the gout pain. We stick with the natural cure which takes longer time to heal. If any of the person in your family has gout, you may have the idea of gout flare-up and how much pain it causes. My husband has a very high pain threshold but this did make him awake the whole night to suffer the pain. The pain really bothers my husband and he could not walk. He has to use a stick to get balance and reduce the joint pain happening during each step. Let’s talk a little bit about gout. Gout develops when excess uric acid forms crystals in the body and this causes the joint pain due to the movement of the crystals in the joint fluid. So the only option to deal with gout attack is controlling the uric acid level. And to lower the acid uric, all the food we consume needs to be watched. Of course we have to come up with a strict diet and no matter how long this takes, I believe that the stricter the diet is, the shorter the healing time is. It’s been a blessing, since we notice that gout flare up at the early stage, there is no swelling point showing up yet. So after one week of strict diet, the pain is gone. And I would love to share you the diet that my husband has been ‘enjoying’ for 1 week. Of course, it is not fun to have the same meal everyday but it cures so he is happy with that. 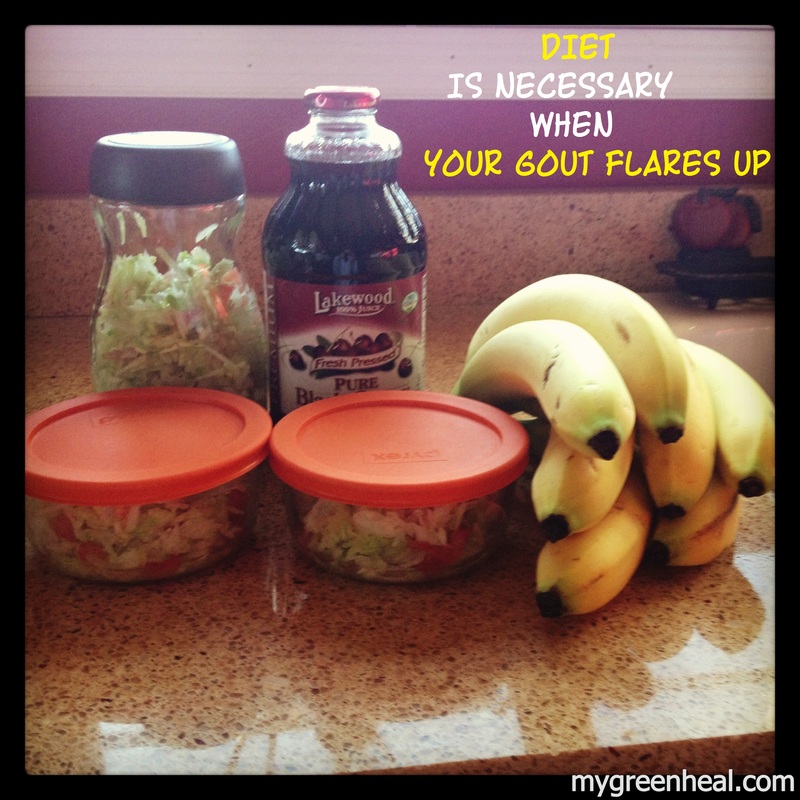 This is the diet that my husband was on during the gout attack period. He has this 3 times per day: breakfast, lunch and dinner, all the same. There are many different meals out there can help with gout attack but I found this diet works the best for my husband. What you see in this photo is a lunch serving I pack for my husband. Chop and toss all the vegetables in a large bowl with the extra virgin olive oil and apple cider vinegar. Mix the veggies well. Squeeze the lime to the salad then mix. Gout flare-up patient needs to eat at least 5 bananas a day. Banana is natural anti-inflammatory food which helps the joint to stop swelling (so you don’t have to take Ibuprofen). Cherry juice or cherries will help you heal quicker.